My wife and I decided to take a short break from Scotland to the South of France in late Summer/early Autumn. We decided on traveling From Edinburgh airport due the convenience of the Easyjet flight. As we were out of the country for 4 days we also opted to try the Flying Scot long stay parking facility close to Edinburgh airport. This is a slightly strange experience, handing your keys to a complete stranger to valet park. The short journey by bus (every 15 minutes) makes it worthwhile however. The Easyjet baggage check in was slick and easy to complete. By checking into our flight before we arrived at Edinburgh airport, all we had to do was weigh our own baggage being placed in the hold, on one of the many weighing machines. If your baggage is within the baggage weight limit, the machine prints a luggage tag which you attach to the handle of your luggage, and that's all there is to it. You then take your ticketed luggage to the luggage check in area, show your id and boarding pass and the Easyjet baggage handlers are happy to accept your luggage. Job done in about 4 minutes flat, without lines of queuing! The security checks at Edinburgh airport were pretty slow, but this can be put down to the time of day we were travelling as well as the increased security procedures currently being carried out in the UK. I made things worse by leaving my iPad inside my bag, which meant the whole bag and the iPad were re-scanned separately. The Easyjet flight from Edinburgh to Nice takes 2 hours and 20 minutes, and is very comfortable. We were not flying in high season, so the flight was not full. The cabin crew were very pleasant and the amenities clean and fresh. On landing at Nice we jumped a local taxi to take us the short hop from the airport to our hotel, the Aston La Scala in Avenue Felix Faure in central Nice. We chose to hire a car in Nice, and made use of the app on my iPhone to rent a car in Nice. Many car rental websites offer the facility to download an app for your iPhone, iPad or android smartphone or tablet. Some now even offer this facility for your Kindle Fire or Kindle phone. When you hire a car in the South of France it allows you to visit many sites in and around the South of France including Monaco and Cannes. 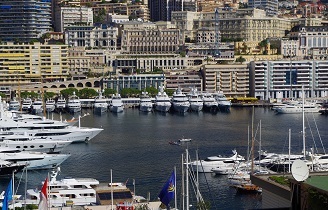 Monaco is a mere 20km and takes approximately 30 minutes to drive. Once there you will be astounded by the scenery, the towering cliff tops and the blue harbour, welcoming the yachts and boats from the worlds wealthiest people. Above the harbour, the palace walls dominate the skyline, along with their surrounding gardens and aquatic museum. A short drive or walk up the hill brings you to the Monte Carlo casino, with a procession of expensive and unique vintage cars circling around the gardens in front of the casino. There are strict dress regulations for entry into the casino. I thought I was going to be in trouble by wearing shorts, but it was my wife's flip-flops which proved to be the reason for not being allowed inside. Nice itself has many tourist attractions, restaurants and bars all within walking distance, or by tram, so arranging a car hire in Nice is not required for this. The weather in Nice in mid September is still very warm although when we were there, we encountered a severe thunderstorm which curtailed some of our planned activities. So would we go back to Nice again? Definitely, although probably earlier in the summer to avoid the thunderstorms. Would we hire a car in The South of France again? Definitely, only this time we would probably rent a car in Nice initially, and travel a bit further afield, or even avoid the expensive hotels and hire a Motorhome in the South of France and travel at our leisure.